3 bedroom 3 bathroom home that has been beautifully furnished with top of the line furnishings, flat screen Tvs in bedrooms and in the living room with a beautiful pool and Lake view! This home is located in a quiet gated community called The Reserve at Town Center. There is a supermarket and restaurants just a couple of minutes from the home and Interstate 4 is less than a 5 minute drive away. 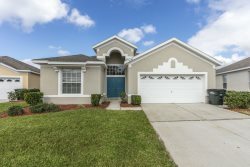 Disney is within a 10-15 minute drive from this beautiful vacation home and all other theme parks can also be reached easily via I4.